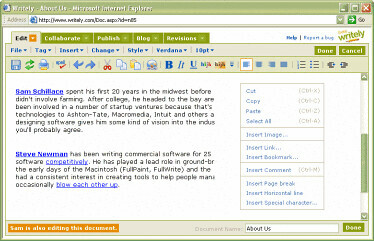 Google recently bought Writely. I checked it out and its a rather good idea! Basically its your ordinary word processor program but available in your browser. The good thing is that it uses minimal resources from your computer and don't use up all your disk space just for the program. You can also save your documents on the net so you can easy access them from any computer. And as the website says: Can I ... upload from Word? YES! Can I ... save to my desktop? YES! Can I ... publish on the web? YES! Can I ... post on my blog? YES! Unfortunately Google have betafied it for the time being meaning that they dont allow any more users to register for the moment. Wonder if Microsoft and Word will get some tuff competition her?